It happens even to the most careful of people. In a blink of an eye, your cell phone slips out of your hands and falls crashing down on hard pavement below. Picking up its damaged remains, you may wonder if you can (and should) repair or replace the cracked cell phone screen. The steps that you should take when addressing a damaged phone screen will depend on the severity of the damage. In all cases, take some time to assess just how bad the damage is. Look at your phone under good light and from several angles. In most cases, even if the screen looks like it is totally shattered, the actual pieces should mostly stay in place. However, it is probably a good idea to err on the side of caution. Avoid holding the cracked glass up to your ear for phone calls, for instance. You may also want to minimize usage in general as to avoid cutting your fingers. 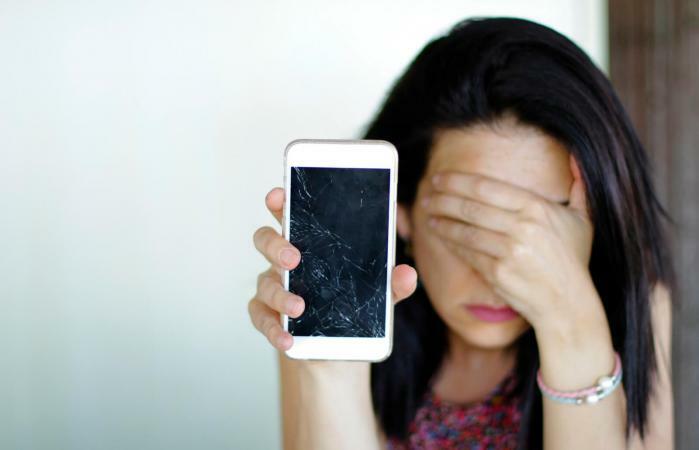 When you look down at your cell phone screen and see that it is scratched or even cracked, it's important to recognize exactly what it is that you are seeing. What you normally think of as the "screen" or the "display" typically consists of two main parts: (1) the glass and (2) the digitizer. This is generally true for most touchscreen-enabled devices like smartphones. The surface you actually touch is the outer pane of glass. Underneath that is the digitizer, which is the layer that recognizes your taps and swipes as input. In some phones, these two components are separate. In other phones, the two components may be fused together. It is important to make this distinction in the context of cell phone repair. Surface scratches on a separate pane of glass are typically easier and more affordable to fix than damage to the digitizer. If you are not going to repair the phone right away, place an inexpensive plastic screen protector on it to hold the pieces in place in the interim. Regardless, it is a good idea to ensure you have backed up the important data on your phone like your photos and messages, just in case. You might consider taking the do-it-yourself approach to fixing your cell phone screen, particularly if you do not have a cell phone insurance policy and you are outside the warranty period. If all you see on your phone screen are some minor nicks and scratches, you may be able to hide these blemishes with some simple DIY solutions. For a small scratch, you may try a little toothpaste on a cotton swab. Rub it into the scratch gently and you may be able to hide the damage. A few other options you might consider include vegetable oil, baking soda, or even sandpaper. Proceed at your own risk and discretion, as it is possible you may even cause more damage. If you already have the technical skills and experience, particularly if you've worked with small electronics before, you might consider tackling the project of replacing a broken cell phone screen yourself. There are a number of terrific how-to resources online, including extensive teardown guides from iFixit and several videos on YouTube. You will need a basic cell phone repair kit as well as the specific parts for replacing the screen on your model cell phone. These can be purchased online from Amazon, eBay, and the iFixit store, among others. If you are uncomfortable with taking your phone apart, which may involve literally prying it apart, cutting through adhesive, and voiding your warranty in the process, it may be best to take it to a professional. Local cell phone repair shops are available nationwide. Search for one near you. There are 450 Cell Phone Repair (CPR) store locations throughout the U.S., as well as many independent stores. Puls Technologies deploys cell phone repair professionals to customers' homes. Best Buy's Geek Squad offers cell phone repair at select locations. Best Buy is an authorized service provider for Apple and Samsung. If you crack the screen on your iPhone, consider taking it directly to Apple. iPhone screen replacement costs about $30 if you have AppleCare+ and approximately $130 to $280 if it is out of warranty. RockIT Repairs in Virginia offers a mail-in repair service. Check the website for the latest pricing. Depending on the age and the value of your phone, you may or may not decide to repair the screen after it has been seriously damaged. The average American upgrades his or her smartphone every two years, so you may choose to replace your phone rather than fix the screen.